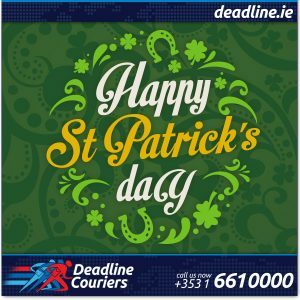 First and foremost wishing everybody a very Happy Paddy’s Day… and following weekend for those lucky enough to take Friday off. What do you get when you do the Irish jig at McDonalds? Why can’t you borrow money from a leprechaun? Because they’re always a little short. That may not be a big deal to you, but I’ve never driven a bus before. Q: How is a best friend like a 4-leaf clover? A: Because they are hard to find and lucky to have. Q: What do ghosts drink on St Patricks Day? Q: Why wasn’t Jesus born in Ireland? A: He couldn’t find 3 wise men or a virgin. Q: How can you tell if an Irishman is having a good time? A: He’s Dublin over with laughter! Q: What do you get when you cross a pillowcase with a stone? Q: Why do people wear shamrocks on St. Patrick’s Day? A: Regular rocks are too heavy. Q: How does every Irish joke start? A: By looking over your shoulder. Q: What has eight arms and an IQ of 60? A: Four girlfriends (blond?) drinking on St Patricks Day! Q: How did the Irish Jig get started? A: Too much to drink and not enough restrooms! Q: Why did God invent Jameson whiskey? A: So the Irish would never rule the world. Q: What do you call an Irishman who knows how to control his wife? Q: What’s the main difference between an Irish wedding and an Irish funeral? Q: What do you call a diseased Irish criminal? Oh and by the way, we could do with a LIKE in Facebook if you think we deserve it! !